Jonathan Harshman Winters III was born on the 11th November 1925, in Bellbrook, Ohio USA, and was an actor, comedian, author and artist who received 11 nominations for Grammy Awards, and won the Grammy for the Best Album for Children for contributions to the “Little Prince” (1975) and the Grammy award for the Best comedy album “Crank (y) Calls” (1996). Jonathan Winters had been active in the entertainment industry from 1949 to 2013, when he passed away. How much was the net worth of Jonathan Winters? It had been estimated by authoritative sources that the overall size of his wealth was as much as $5 million, converted to the present day. To begin with, Jonathan Winters was raised in the town Bellbrook. His childhood was overshadowed by the alcoholism of his father and subsequent divorce of his parents. With his mother Alice Kilgore, he moved first to Springfield and then to Dayton. At the age of 17, Jonathan went to the school for sailors, and served two years in the Navy, taking part in the fighting in the Pacific during World War II. When he returned, he enrolled at Kenyon College, and then studied at the Dayton Art Institute, where he showed artistic talent as a cartoonist. Winters career in the entertainment industry began in 1948, when he unexpectedly won a local talent show with comic sketches. He was noticed and invited to work in radio transmission in a variety of capacities, starting with weather reports and moving to comedy numbers. Then, Winters was invited to Columbus’ WBNS-TV channel, although he refused because he was dissatisfied with the proposed salary, and decided to move to New York. Winters managed to get a job in a nightclub, and at the same time he was looking for an opportunity to get onto the central TV channels. In 1952, Winters managed to get a small role in the television series “Omnibus”, after which the young actor’s career developed quickly. 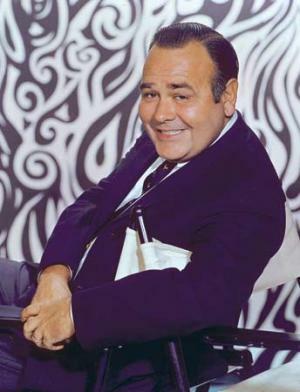 Concerning a long spanned career, Winters created characters in a number of series and television movies – “The Jonathan Winters Show” (1956 – 1957), “It’s a Mad, Mad, Mad, Mad World” (1963), “The Garry Moore Show” (1968), “The Wacky World of Jonathan Winters” (1972-1974), “Mork & Mindy” (1981) and “Spaced Out!” (1991) among many others. He also voiced Grandpa Smurf in the film “The Smurfs” (1986-1989) and Papa Smurf in “The Smurfs” (2011). In 1991, Winters won an Emmy for his role in “Davis Rules”, and in was awarded the Mark Twain Prize for the show “American Humor”. In 2002, he earned an Emmy nomination as a guest star in a comedy series, actually “Life with Bonnie” – this recognition certainly helped his net worth grow. Moreover, Winters is also known as an artist, having painted and drawn sketches which were published in many collections. He authored several books too, including short stories entitled “Winters’ Tales” (1988) which is on the list of best-selling books. His last film was dubbed “The Smurfs 2” in 2013. Finally, in the personal life of Jonathan Winters, he was married to Eileen Schauder from 1948 until her death in 2009; they had two children. Winters died at the age of 87 of natural causes on the 11th April 2013 in Montecito, California. Date Of Birth November 11, 1925 Bellbrook, Ohio, U.S.
Died April 11, 2013 (aged 87) Montecito, California, U.S.
1 [re comedy icon Stan Laurel] Damn it! I'm the only one out here who never managed to meet him. And there he was, sitting right out there in Santa Monica all those years. The Oceana Apartments, wasn't it? I'll never get over that. 2 I've done for the most part pretty much what I intended. I ended up doing comedy, writing and painting. I've had a ball. And as I get older, I just become an older kid. 3 Of course there are those who can paint much more quickly than I. They take cobalt blue, throw it against a 15-by-20 canvas and say, "Ah, look, this is 3 o'clock overlooking Central Park". Then, when someone says, "I don't get it", the artist replies, "You don't get it? It's the happening, it's the feeling. And it costs $200,000". It's a slap in the teeth to talented, struggling people who studied art when some little dummy comes along with two brushes, drinks a lot of turpentine, smokes four joints and says, "Hey, man, is this not out of sight?". 4 [on painting] This year  I got the idea when I was sitting in a hamburger joint and a hearse pulled up. A few minutes later a U-Haul parked behind the hearse. I want to do a picture of a horse pulling a U-hearse entitled 'You Can't Take It With You'. 5 As a kid, I always wanted to be lots of things. I was a Walter Mitty type. I wanted to be in the French Foreign Legion, a detective, a doctor, a test pilot with a scarf, a fisherman who hauled in a tremendous marlin after a 12-hour fight. 6 [when someone asked him how to get into show business] You know how movie studios have a front gate? You get a Camaro with a steel grill, drive it through the gate, and once you're on the lot, you're in showbiz. 7 I don't do jokes. The characters are my jokes. 8 If your ship doesn't come in, swim out to it. 1 Made his first appearance on I've Got A Secret (1952) with his mother, Alice Bahman, who was a radio personality in her own right on WIZE in Springfield, Missouri. The episode aired on September 28, 1960. 2 Finished recording his dialogue for The Smurfs 2 (2013) only nine days before his death. 3 He only did one serious role and that was The Twilight Zone: A Game of Pool (1961), a two-character show in which he played "James Howard (Fats) Brown", co-starring with Jack Klugman. 5 When Stanley Kramer offered him a part in It's a Mad Mad Mad Mad World (1963), he almost didn't take it because he had just recovered from a nervous breakdown. His wife talked him into it. 6 As of November 2002, he was doing impromptu, free comedy routines the first Sunday of each month during the Ventura County Antique Fair Grounds and in November/December 2002 in San Francisco on the set of Swing (2003), directed by Martin Guigui where he plays the character of Uncle Bill. 7 He was said to have worshiped the work of Stan Laurel, and was very close, in his final years, with an admirer of his own, Richard Lewis. 8 Spent eight months in hospital in 1959 and 1961 undergoing treatment for bipolar disorder and nervous breakdowns. 9 Winters' career started as a result of a lost wristwatch, about six or seven months after his marriage to Eileen in 1948. The newlyweds couldn't afford to buy another one. Then Eileen read about a talent contest in which the first prize was a wristwatch, and encouraged Jonathan to "go down and win it". She was certain he could, and he did. 10 Dropped out of high school to join the Marines. 11 Suffered from bipolar disorder. 12 His popular drag character Maude Frickert was inspired both by one of his aunts as well as by character actress Maudie Prickett, who also was billed occasionally as Maude Prickett. 13 Has a star on the Hollywood Walk of Fame at 6290 Hollywood Blvd. 14 In a 1985 television special, named King Kong (1933) as the film that made the biggest impression on him in his youth. 15 In 2000 he won the Mark Twain Prize for American Humor, presented annually by the Kennedy Center in Washington, D.C.
16 Father, with Eileen Winters, of son Jay Winters and daughter Lucinda Winters. 17 He was of German and British Isles/English ancestry. 18 According to the book "Tomorrow I Die", Winters appeared in the short film "Screen Test of Mike Hammer" as a wino. This film also featured Jack Stang and Bettye Ackerman. Stills are found in the aforementioned book. 19 He made his semi-annual visit to the "Hollywood Collectors & Celebrities Show" for an autograph session and to meet his fans. 20 Much of the dialogue between he and close friend Robin Williams on Mork & Mindy (1978) was ad-libbed. 21 Considered by many to be one of the finest improvisational comics ever. 22 Was voluntarily institutionalized twice in his life (and even made light of it in his stand-up comic act). 23 Wrote a collection of short stories entitled "Winters Tales". 24 Served in the Marines during World War II as gunner on the aircraft carrier Bon Homme Richard in the Pacific. 25 An accomplished abstract painter, he created a series of work which was collected into a book titled "Hang Ups". David Letterman's 2nd Annual Holiday Film Festival 1986 TV Movie segment "My Day With the Stars"
1996 Grammy Grammy Awards Best Spoken Comedy Album For the album "Crank(y) Calls". 1960 Star on the Walk of Fame Walk of Fame Television On 8 February 1960. At 6290 Hollywood Blvd. 1964 Golden Laurel Laurel Awards Top Male New Face 5th place.